There’s a flu going around just now that responds to Oscillococcinum initially–also if you take a microdose [just a few granules] after exposure and before onset, you can stave it off completely–and then moves into a congestion stage with frontal sinus pain, post-nasal drip, and/or cough. I’m a fan of Kali Iodatum for a lot of these thick mucous – cough situations. It is not in the homeopathic literature with that kind of description, exactly. Boiron says it’s for colds with frontal sinus pain. Similisan has it in a mucus syrup for cold, fever, sneezing, runny nose, and head congestion. But I actually find it helpful in situations where one might consider Kali Bichromicum but Kali Bich does not help or where one is more mucous than that. In a lot of ways, it is actually my go-to for a mucous cough. Similisan’s Mucous Syrup Active Ingredients List + Kali Iodatum in 30c and 200c. I discovered Kali Iodatum on account of success using Similisan’s mucous syrup for my daughter. One thing I used to do early on in my homeopathic usage days was that if a commercially available combination worked [such as in this syrup], I would check the back of the box/bottle. There, you’ll find a list of the homeopathic remedies contained in therein, as well as the symptoms for which they are included. I’d pick the remedy that I thought most closely matched the symptoms for which I was using the product, and then I would buy that remedy in potency. Often, combination homeopathic products contain low potencies — often X potencies and sometimes low C potencies. 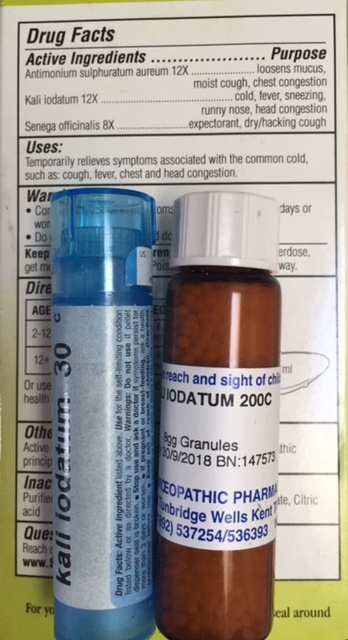 So if a combination homeopathic product is helping but not enough or for less than two hours between doses, consider selecting the best-matching remedy from their ingredients list and purchasing that one in potency [e.g., as 30c from your local healthful store or 200c from some specialty pharmacies, like Hahnemann Labs]. You might recall that’s my ‘ping’ method: If a remedy works a little bit but not enough, chances are that you need a higher potency. If it helps sufficiently but you need to re-dose in less than 2 hours, it’s also often a sign that you would benefit from the next-higher potency, if you have it. My dad recently caught the flu from someone sitting behind him on a 4-hour flight. The poor fellow was hacking and coughing miserably the entire time, and by the time my dad returned home a few days later, he was sinking quickly. Had he taken Oscillococcinum or other immune boosters right then and there, he might’ve been fine. But anyway, he took Oscillococcinum for a couple of days until the aching and fatigue and fog lifted. –The guy on the plane was miserable, so it sounded to me like one tough virus. –I had heard that people using conventional approaches were suffering a flu that was followed by 3-4 weeks of a miserable cough. –It is much easier to maintain a healing momentum, to nip something, than it is after the vital force has been made dreary by weeks of fighting the virus. So, when I saw my father, I gave him one dose of Kali Iodatum 30c and one dose of Kali Iodatum 200c. He putt he 30c in water and felt only a little benefit. So he put the 200c in water, and he was finally cough-free for 12 hours. But he still was a little gunky, so occasional dosing was still required. Tip: One of the mistakes that we tend to make with homeopathy is dosing too seldom and for too short a duration. Make sure that you really stay tuned-in to how you are responding to a remedy, and stay on-top of your dosing. Don’t quit too soon, either! One more story that also relates to combinations… My neighbor’s little one was suffering from colic. She had tried everything and now was considering just about anything. I said I’d put together a remedy for her, and I intuitively chose Carbo Veg 200c. Meanwhile, she was headed to the store where she picked up Cocyntal, a Boiron homeopathic combination for colic. She had to give him doses every few hours, but she was amazed at how well he responded to it and that he was able to sleep so easily, etc. Ironically, it has Carbo Vegetabilis in it! So, when she gave him the Carbo Veg 200c the next day, he only needed one dose and that was the end of his colic! Sidenotes: I read an interesting article in Homeopathy Today about the use of Polarity Analysis in cases of infant colic. The author stated that typically one dose of the correct remedy in 200c is sufficient to put an end to the colic. Although Carbo Vegetables is not an oft-cited remedy for colic, it is remarkable that Boiron selected it for inclusion in their colic combination. Interestingly, Carbo Vegetabilis is made from vegetable charcoal and the “homeopathic corpse reviver.” In my reading on the matter I discovered that infants who were blue or flat-lined or lacking that initial first breath and then develop colic often benefit from Carbo Vegetabilis. My neighbor did not know for sure if her son fit that profile, but her labor and delivery were complicated and ended with a difficult forceps delivery. I thought how beautiful of homeopathy and Spirit to know that and help this baby heal from that experience and its ramifications. Unrelated Tip: If life is rough and you find yourself feeling sorry for yourself, or like you are not worthy, or you do not have enough, give. Do something for someone else in whatever way feeds your soul. Cool! I made it into the blog!